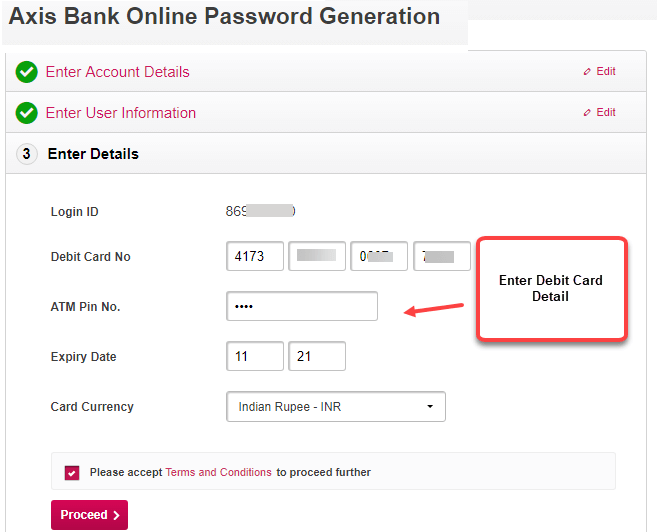 Axis Bank customers can register for Axis net banking online using Debit card, no need to visit Bank. Axis Bank is one of the largest private sector Bank in the country. You can open a regular saving account with 10,000 initial deposit and now you can apply Axis ASAP zero balance saving account online. Axis Internet Banking facility is a free facility to manage bank account online and avail many online services. Through Net Banking you can transfer money, request new ChequeBook, Manage Debit card, check account balance and statement & many more. 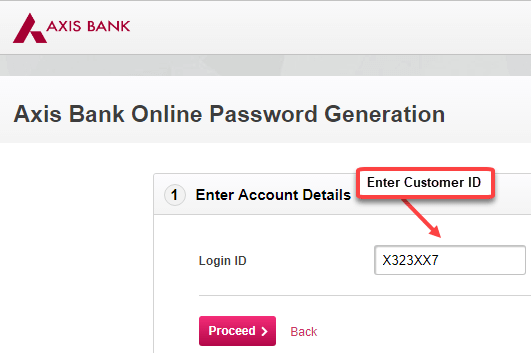 If you are existing Axis Bank customer then follow below step by step process and activate Axis Bank net banking online. To complete Axis Bank Internet Banking Activation you need your Customer ID, Account number & active Debit Card. You can find your customer ID on your passbook, ChequeBook or send an SMS to know your Customer ID. Here you have to click on REGISTER. 2 Next screen type your Login ID. The customer ID is your login ID. You can find your Customer ID in welcome kit. Type here and click on Proceed. 3 Now in the next screen you have to type your account number and Registered Mobile Number. After typing both, click on Proceed. 4 In next screen you have to type your Debit Card Number, PIN and expiry date. Then click on proceed. 5 In the last step you have to set up Login Password. 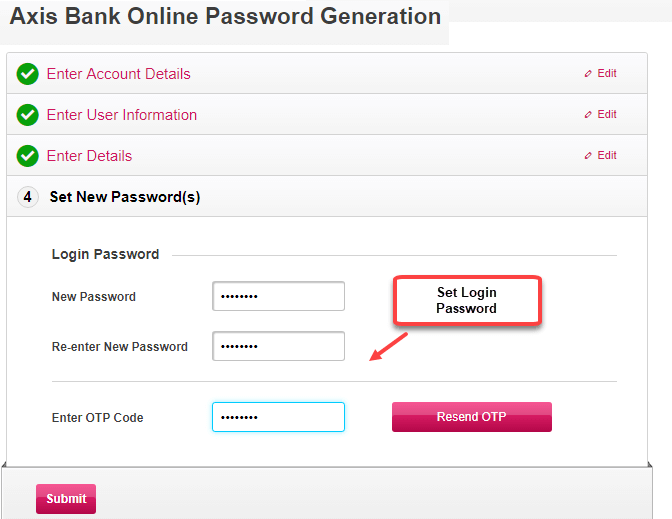 Set Strong Login Password, enter the OTP that received on your registered mobile number. If you did not received, just click on Resend OTP button. Done! you have successfully activated Axis bank Internet banking. You can see the success message in the next screen. Now login to your net banking account. You can use your User ID & password OR Debit card number & PIN to login your account. 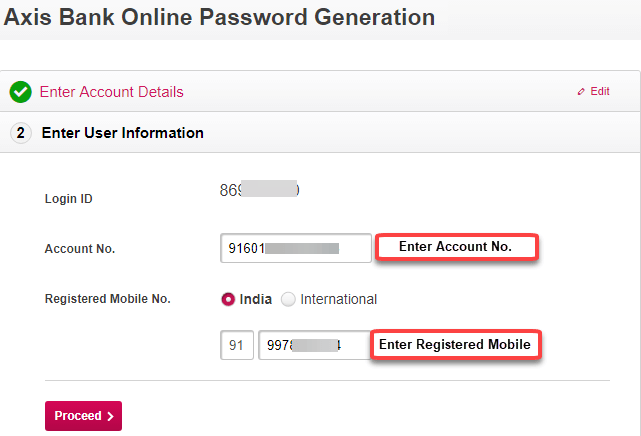 So in this way, Axis bank customers register for Internet banking online without visiting branch.